I paid $6 for this record. 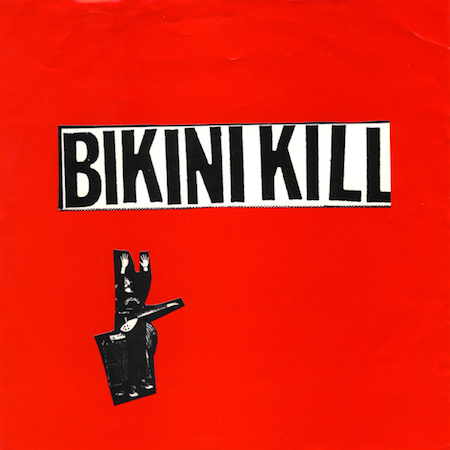 Man, Bikini Kill is the best. I'm glad my heaps of privilege allow me to buy a sort of expensive used copy of this record and listen to these two classics how they were intended. I'm a bit sad that I missed out in '95 because I had the whole punk scene to my privileged self and didn't realize that this band was representing a section of marginalized people in such a tremendous way. Then again, I was only 18 and teenagers tend not to look beyond their own selves. But I tell you what, I definitely learned to love the women that loved Bikini Kill. Listening to this record reminds me of the characteristics of the women I've dated since that I loved the most. Bad asses who push for what they want with little regard for societal constraints. At the same time, I try to recognize that the Bikini Kill version of standing up for one's self is just one version and there are many flavors of smashing the patriarchy. I always feel a bit guilty about this review where I wanted the girl band touted as post-riot grrrrl to be more Bikini Kill punk style instead of dancey lo-fi. Women, be who you want, and don't let this privileged, hetero, white dude tell you what's up. Oh, wait was I supposed to talk about music in this review? Have you never heard Bikini Kill? Well, you're blowing it. Super good DIY punk songs, with some great growly/screamy bits. Classic lines like "She's so very I don't care" sung real nice contrast those growly bits and a bit of Jello Biafra/70's punk vibrato in the verses. Big crashing waves of guitar and in-your face cascades of crash cymbals. The title track is definitely the stronger track, but the B-side has some good variation for swaying along to as you recover between dancey songs at a live show. It has definite passion behind it, as well. And perhaps that's what make these songs stay amazing. You can tell there was a passion put in to them. This band is going to be representative of an important moment in music for a long time.